292 pages | 66 B/W Illus. 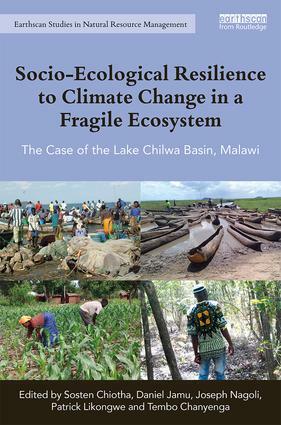 The Lake Chilwa Basin Climate Change Adaptation Programme was a seven-year research and development programme in Malawi that concluded in March 2017. The programme was designed to protect the livelihoods of the population and enhance resilience of the natural resource base upon which it depends. The Lake Chilwa Basin is an important wetland ecosystem which is a designated Ramsar Site under the Ramsar Wetland Convention and a Man and Biosphere Reserve designated by UNESCO. This book provides a review of the research and programme interventions done based on the ecosystem approach (EA), a strategy for the integrated management of land, water and living resources. This is designed to promote biodiversity conservation and sustainable use in an equitable way in its implementation of mitigation and climate change adaptation interventions. It is shown how: local and district institutions were strengthened to better manage natural resources and build resilience to climate change; cross-basin and cross-sector natural resource management and planning for climate change throughout the Basin were built; household and enterprise adaptive capacity in Basin hotspots was built; and improved forest management and governance contributed in mitigating the effects of climate change. The study followed all the twelve key EA principles with involvement of all key stakeholders. It is one of the first programmes to apply EA on such a wide temporal and spatial scale and provides key lessons to be learned for the protection of other fragile ecosystems in an era of climate change. Sosten Chiotha is the Regional Programme Director for Leadership for Environment and Development (LEAD) Southern and Eastern Africa in Malawi. He coordinated, from 2010 to 2017, the Lake Chilwa Basin Climate Change Adaptation Programme (LCBCCAP), the basis for this book. Daniel Jamu is Deputy Chief of Party FISH Project, Malawi and Adjunct Professor, University of Rhode Island, USA. He holds a PhD in Ecology from the University of California, Davis, USA. Joseph Nagoli is the Research Leader of WorldFish programme in Malawi. He holds a PhD in Rural Development (Anthropology) from the Swedish University of Agricultural Sciences. Patrick Likongwe is a Research and Training Specialist for LEAD and was the Programme Manager for the Lake Chilwa Basin Climate Change Adaptation Programme in Malawi. Tembo Chanyenga is Director of Forestry Research Institute of Malawi with excellent track record in forestry research and tree planting activities demonstrated by 36 years’ experience in forest management.